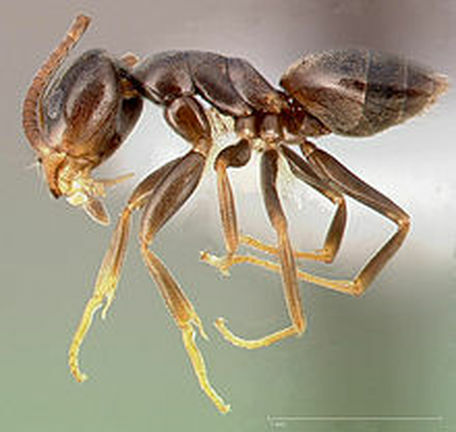 This is an Odorous Ant. This ant gets its name from a distinct smell of rotten coconuts that it emits when it's stepped on or crushed. In addition to this funky smell, you can tell an Odorous Ant by their black or dark brown color and how their thorax is not shaped evenly when you look at them from the side. See the picture of the ant above for an example. What do Odorous Ants eat? If these ants are living in your home, they are most likely feeding on food scraps. They prefer sugary food but are not opposed to eating other foods that are left out. If they are living outside they will feed off the honeydew that aphids produce as well as sweet tree sap. How do Odorous Ants get into my home or business? Ants are always wandering in search of food and new territory. This is especially true if something happened to their old home, such as a large rain storm. They will crawl up through your floor boards and make a new home for themselves. How do I get rid of Odorous Ants? Odorous Ant nests can be anywhere in your house, so getting an inspection is the first step. After we find the location of the colony, we can treat the area and prevent your ants from coming back. For information about Pharaoh Ants, click here!